Washington, DC – Wyoming’s leadership in advancing carbon management technology was highlighted today at a hearing in Washington, D.C. where congressional leaders took note of the innovative Wyoming Integrated Test Center (ITC) public-private partnership that resulted in one of the first testing facilities in the United States that could host large pilot scale projects. 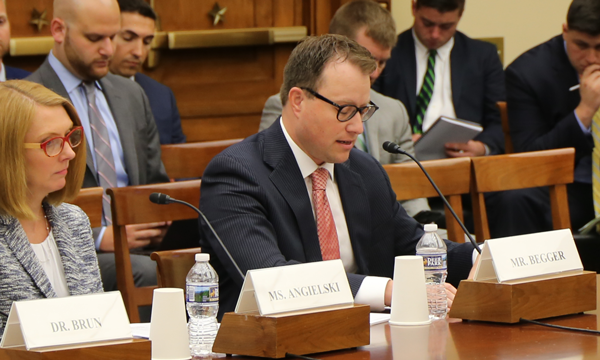 Begger testified before the U.S. House of Representatives Committee on Science, Space and Technology Subcommittees on Energy and Environment today. The hearing, entitled “The Future of Fossil: Energy Technologies Leading the Way,” brought together scientists and leaders in energy technology to look at innovative solutions being pioneered in the United States to ensure a viable, long-term future for the nation’s fossil fuels. Other panelists included Dr. Roger Aines, senior scientist at the Atmospheric, Earth and Energy Division, Lawrence Livermore National Laboratory, Dr. Klaus Brun, program director at the Machinery Program, Fluids & Machinery Engineering Department, Southwest Research Institute and Ms. Shannon Angielski, executive director of the Carbon Utilization Research Council. In his testimony, Begger noted that federal research around the globe has helped drive many of the most important technologies of the last sixty years, from touch screen glass and GPS to microwave ovens and the internet. Early government support can make a significant difference in progressing new and innovative technologies. The ITC is just one of a number of Wyoming programs aimed at commercializing next generation coal technologies. Wyoming has invested millions over the past 15 years to conduct the basic and applied research necessary to understand all of the various components of a large-scale CCUS project. The ITC celebrated its official completion with a dedication ceremony in Gillette in May, marking the construction end of this pioneering private-public partnership and launching a new chapter in innovative research and testing. The ITC will provide space for researchers to test Carbon Capture, Utilization and Sequestration (CCUS) technologies using actual coal-based flue gas from the Dry Fork Station near Gillette. Below please find the written testimony submitted by Begger. The Wyoming Infrastructure Authority is a state instrumentality created by the Wyoming Legislature in 2004 to promote and assist in the development of energy infrastructure. Under our legislative authority, we work to construct electrical transmission lines, advanced generation facilities and coal export terminals. We also have the ability to issue up to $1 billion in industrial revenue bonds to assist with project financing. Currently, our largest project is the Wyoming Integrated Test Center (ITC), which was officially dedicated in May 2018. The ITC is a private/public partnership between the State of Wyoming, Basin Electric Power Cooperative, Tri-State Transmission and Generation Association and the National Rural Electric Cooperatives Association (NRECA). We have also received various in-kind contributions from Black Hills Energy and Rocky Mountain Power. The ITC is a post-combustion, flue gas research facility located at Basin Electric’s Dry Fork Power Station near Gillette, Wyoming. It will be the largest facility of its kind in the United States, delivering up to 20 MWe worth of scrubbed flue gas to researchers testing Carbon Capture, Utilization, and Storage (CCUS) technologies. The power plant will provide flue gas to six small research bays, each capable of hosting tests up to 0.4 MWe and a large test bay that can host two demonstration projects with a cumulative total of 18 MWe. We have raised $21 million in funding, $15 million from the State of Wyoming, $5 million from Tri-State G&T, and $1 million from NRECA. $14.9 million has been budgeted for capital construction and approximately $900,000 for annual operating costs, providing us with the resources to construct and operate the ITC for 7 years. While we believe there is an important role for the Federal Government to play in advancing technology and we would welcome such a partnership, not one cent of federal funding has been utilized at the ITC. The State of Wyoming is the nation’s largest coal producer, producing approximately 300 million tons in 2016. While this is still a significant amount of production, it is down from the peak in 2008 of 480 million tons, a drop of 37.5%. Coupled with similar drops in crude oil and natural gas prices and production, Wyoming has experienced significant reductions in tax revenues. Given fossil energy’s prominent role in the state, investment in carbon control technologies by Wyoming may seem unusual, but it all stems from Governor Matt Mead’s directive to move beyond the political rhetoric surrounding climate change science and focus on discovering technological solutions to ensure the long-term economic viability of Wyoming’s fossil energy resources. Reviewing where Wyoming could make the most impact in carbon management technology development, it was discovered that there are no testing facilities in the United States that could host pilot scale project greater than a few megawatts. In fact, the Department of Energy (DOE) has funded testing projects at Technology Centre Mongstad (TCM) in Norway due to the lack of a suitable site in the U.S.
National Carbon Capture Center (NCCC) is a DOE funded facility that is operated by Southern Company at one of their coal-fueled power plants near Wilsonville, AL. They are the preeminent facility in the United States on carbon management, but the largest test they can host is about 1.5 MWe. Most utilities say they need to see a successful test at greater than 10 MWe before having the comfort to construct a commercial facility. Large pilot testing does occur in the United States, but it is very difficult for researchers to obtain permission to test at an operating power plant. The ITC aims to eliminate this hurdle by having the offtake equipment and relationship with the utility in place to become a “plug and play” facility for CCUS technologies. The ITC formalized a two-year cooperative agreement with NCCC to tap into their expertise and gain access to the researchers who have been successful at smaller scales and are ready to scale up their projects. The University of Wyoming School of Energy Resources works on small scale, academic research; the Wyoming Pipeline Initiative is working to pre-permit corridors for CO2 pipelines; the Wyoming Enhanced Oil Recovery Institute researches the reservoir geology and is identifying carbon sinks for EOR opportunities and the Center for Economic Geology Research has active grants with the Department of Energy to study permanent geologic sequestration. The one constant variable for all of these state entities is a push to commercialization. Every project needs to continuously track costs and economics, because without a demonstrable path to commercialization, all you have is an interesting idea. Strong partnerships with the private sector, especially those industries that would ultimately be a customer of the technology, helps ensure our research objectives are aligned with their economic needs. A great example of how this has been successful for Wyoming is the ITC’s Technical Advisory Committee. This committee is comprised of representatives from major utilities who are involved in the technology evaluation processes for their various companies and they provide this expertise to reviewing applications for technologies wishing to test at the ITC. If a utility does not see a particular technology as something they would employ, it is not given priority. Carbon management is a two-phase process. First, the CO2 must be economically and efficiently captured from the source. In the case of a coal-fueled power plant, about 12% of the exhaust gas is CO2. In a plant such as Dry Fork Station, which utilizes state of the art scrubbers, low NOX burners, bag houses and activated carbon to remove the sulfur dioxide, nitrous oxides, particulates and mercury, the remainder of the flue gas is largely water vapor. The second phase is utilizing the CO2 in some capacity. Generally, the CO2 is compressed into a supercritical liquid that can be more easily transported by pipeline or truck. The largest consumer of CO2 is currently EOR. It can also be injected into suitable geologic formations for permanent disposal or converted into some other product. There are a number of different capture technologies, although the most commercial post-combustion CO2 capture technologies are liquid amine systems. The Boundary Dam and Petra Nova CCUS projects utilize amines to capture CO2 for use in EOR. TCM in Norway and NCCC are leading research on solution-based CO2 capture. In Wyoming, we didn’t want to duplicate work already being done; we wanted to compliment other test centers by providing a place to scale up current laboratory research or look at other novel technologies. In April 2018, Wyoming, the Japanese Ministry of Environment, the Japan Coal Research Center (JCOAL) and Kawasaki Heavy Industries (KHI) announced an agreement to test KHI’s solid sorbent technology at the Wyoming ITC. This multi-year project will first test the chemical properties such as absorption and degradation rates of the sorbent. If successful, this could lead to additional systems testing, such as utilizing the sorbent in a fluidized bed system. The Wyoming ITC also has a relationship with Membrane Technology & Research, Inc. (MTR). MRT is one of ten teams selected for a Department of Energy large pilot demonstration program, which will award up to $40 million to two promising technologies. MTR’s technology utilizes selectively permeable membranes to separate the CO2 from the flue gas. It looks more like a reverse osmosis water treatment facility than an industrial plant. One technology that has received support from Wyoming is cryogenic carbon capture. The various components in flue gas freeze and vaporize at different temperatures. This technology involves freezing the flue gas and capturing CO2 as a frozen solid. Early tests have shown a 99% CO2 capture rate, costing less than $30/ton and less than a 15% parasitic load. This method has also proven to be very successful at removing sulfur dioxide, nitrous oxide and mercury. While we’ve seen promising results on a small scale, further funding is necessary to test this as a larger pilot project. One of the most exciting partnerships we’ve developed is with the XPRIZE Foundation. XPRIZE organizes and administers competitions looking to solve complex engineering challenges. One of the best-known XPRIZE competitions was the Ansari XPRIZE, which awarded $10 million to the first team to fly three people to space and back twice within 14 days. The NRG COSIA Carbon XRPRIZE will award $20 million in prizes to the teams that are best able to convert CO2 into other valuable products. Originally, 47 teams from seven countries submitted their concepts to convert CO2 into things like carbon nanotubes, methanol, building materials, fish food and plastics. The goal is to turn CO2 into an asset valuable enough to create an economic incentive to capture CO2. Earlier this year, ten teams advanced to the final round of the competition based upon their technical and economic merit. Five will test at the ITC on coal derived flue gas and five will test in Canada at a natural gas facility. In 2020, the grand prize winners will be announced. When you add together all the funds the teams have already raised, the prize money and the costs of the facilities, the total Carbon XPRIZE investment is about $70 million dollars. The five teams coming to Wyoming are from five different countries: The United States, Canada, India, China and the United Kingdom. Based in India, Breathe is producing methanol, a common fuel and petrochemical feedstock, using a novel catalyst. Carbon Capture Machine, based in Aberdeen, Scotland, is the team is producing solid carbonates with applications to concrete and building materials. C4X is a Chinese team producing chemicals and bio-composite foamed plastics. The American team comes from the University of California Los Angeles (UCLA) and they will produce building materials that absorb CO2 during the production process to replace concrete. Lastly, Carbon Cure, based in Canada, is producing stronger concrete. One common theme among all of the finalists is that they are producing products with large markets. With the large amount of CO2 that needs to be managed, the success of conversion technology hinges upon having a large market. While ultimately, we hope there will be a suite of conversion technologies, if everyone made a single product with a limited customer base, the market would be flooded and the economic model would collapse. While on the surface, the prize money itself is not a significant amount in the overall energy R&D space, the competition model provides a few advantages. First, it provides a mechanism to vet technologies. Only the projects that work advance. Secondly, it sets an aggressive timeline. If they don’t meet certain benchmarks, they don’t advance. Thirdly, it opens the door to entrepreneurs and small inventors. Access to capital isn’t an immediate barrier to entry. Lastly, the notoriety and public recognition for winning the competition will attract investors. The model of providing a cash prize, following the testing, is a 180 degree turn from the current grant-based model of funding R&D. However, it is hard to argue with the XPRIZE’s success with the Ansari XPRIZE competition. One $10 million prize spurred 27 teams to invest over $100 million in technology development. Eventually, Richard Branson licensed the technology to create Virgin Galactic and today, the private space travel industry is worth $2 billion, only 22 years after the idea for a competition was created in 1995. Stable, predictable and adequate funding is necessary to commercialize these technologies. On average, it costs about $2-3 million per MW to scale up, meaning that a large pilot could easily cost over $50 million. In the U.S., most researchers rely of cost-shares with DOE. However, the amount of funding available and timing varies and can swing widely depending upon the priorities of the President in office. Congress may need to look at establishing a program to scale-up the most promising technologies. Finding funding to support a new program is always a challenge, however, the coal mined in the U.S. provides an opportunity. The majority of coal mined in the United States is owned by the federal government and leased to companies. These companies pay a variety of taxes, including federal mineral royalties, bonus bids, Abandoned Mine Land Fees and Black Lung Taxes. Every year, the mineral royalties and bonus bids bring in about $500 million. Over a ten-year authorization, half of that could provide about $2.5 billion to fund carbon management research. Last year, Apple celebrated the ten-year anniversary of the first iPhone model. This first version came with 4 GB of memory, a 2-megapixel camera, no flash, no zoom and no video camera. Today’s iPhone X Plus has up to 256 GB of storage, facial recognition, multiple cameras and HD video recording capabilities. Yes, today’s CCUS technology is expensive and still evolving, but as we know, technology gets better and less expensive over time. We need to begin to think about energy technology the same way we think about the technologies we utilize and take for granted every day and recognize the important contributions early government support provided to make them reality. Touch screen glass, which is a staple of today’s smart phones, was developed in the United Kingdom funded Royal Radar Establishment in the 1960’s for air traffic control use. GPS, canned food, microwave ovens, the internet, microchips, vaccines and nylon are items all developed by federal research. Technology is apolitical and the U.S. can make its greatest impact by investing in technology development that can be utilized around the world. There is considerable debate over the future of coal within the United States. However, every credible energy analysis from the UN Intergovernmental Panel on Climate Change to DOE acknowledges large amounts of coal will be used globally for the foreseeable future. Technology is the best way to ensure these countries have access to power, yet can meet environmental goals. I appreciate the opportunity to provide written comments.